I’m finally posting the video from my Redesigning lessons with trudacot presentation at ISTE last year. 3 minutes. Happy viewing! Want to learn more about the trudacot discussion protocol? Caring doesn’t scale. Scaling doesn’t care. Here’s the first promo video for Erin Olson’s and Leslie Pralle Keehn’s Connecting Creativity series. We can be serious about our work and still have fun! Happy viewing! Thanks to Monte Tatom, I am able to share the Twitcast of my presentation to the Administrators PLN at the 2015 ISTE Conference, Beyond TPACK and SAMR: Introducing trudacot to teachers. The video is less than 6 minutes. Happy viewing! Check out all of our other trudacot resources too! What percentage of the learning occurring in your school system would simultaneously satisfy at least two of the above (2Q)? At least three of the above (3Q) for a triple win? All four (4Q) for the quadruple win? If you have a 3Q or 4Q lesson, unit, or activity that you think is worth sharing, let us know below. We’d love to hear about it! It is time for instructors to move from simple questions like, “Do you use technology in the classroom?” to the more complex, “For what purpose, and with what learning theories, should I engage digitally-enhanced pedagogies?” I have suggested a way forward that I have found useful, an initial attempt explicitly to address why, and for what reasons, I have proceeded with digital practices in the classroom. These four pillars – forming collaborative relationships with peers, preparing for citizenship, encountering difference and disagreement, and welcoming complexity – represent four possible emphases, and surely there are others. A teacher may wish to emphasize a particular pillar more than others. You and I can, together, develop practices that match with our courses, our pedagogical gifts, and our particular subject matter. Ultimately, I invite us to move away from easy answers, whether for or against technology in the classroom. The nature of these challenges still defies simple conversations around the departmental coffee pot, so let us, with digital wisdom, welcome the questions. Our teacher discussion protocol, trudacot, can help with this! The video is titled Transforming Schools. Happy viewing! Tools, tools, tools! These sessions focus on software, apps, extensions, productivity and efficiency, how-to tips, etc. Little emphasis on learning, heavy emphasis on how to use the tools. Technology for school replication. These sessions focus on the use of digital technologies to replicate and perpetuate schools’ historical emphases on factual recall and procedural regurgitation, control and compliance, students as passive learners, etc. Behavior modification apps, teacher content transmission tools, flashcard and multiple choice software, student usage monitoring programs, and the like. Technology for school transformation. 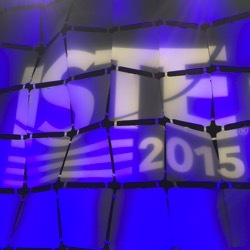 These sessions focus on deeper learning, greater student agency, and perhaps real-world, authentic work. Learning technologies tend to be divergent rather than convergent, foster cognitive complexity, and facilitate active, creative student-driven learning. We need more of #3. Lots more. Right now these sessions are still a significant minority of sessions at ISTE (and most other educational technology conferences). Which kinds of sessions did you attend? What does that mean for your ability to effectuate change back home? Which kinds of sessions did you facilitate? What does that mean for your responsibility as a presenter to help others effectuate change back home? Yesterday I gave a 3-minute video presentation to the ISTE Board on What’s the next big thing in educational technology? If “it’s not about the technology, it’s about the learning,” then why are we centering so many of our sessions on the tools? The work of transforming school systems is difficult work. School transformation stems from personal transformation, not from devices or apps or software. How many of us can say that we’re truly transforming more than a small handful of other educators? The work of transforming school systems is slow work. Some of us have been at this for a decade or two (or longer). How do we invest in and energize both ourselves and each other so that the frustrations, sluggishness, and setbacks don’t win? 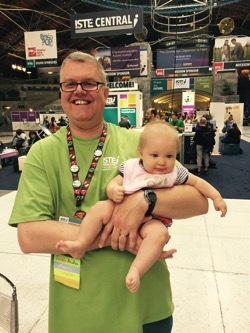 We should have more babies at ISTE. Who doesn’t love babies? !